Happy Christmas Eve everyone! Today I’m sharing with you an incredibly easy yet delicious cheat’s version of the classic French Christmas dessert – Bûche de Noël. Using an electric mix, mix cream, sugar and vanilla together until stiff. Fold in the cocoa until combined. Spread a small amount of the cream along a long, rectangular serving plate to make a base. Spread 1 biscuit with 1 ½ teaspoons of cream and then top with another biscuit. Top with another 1 ½ teaspoons of cream and then place biscuits on their side onto the cream base on the serving platter. Repeat until all biscuits have been used, to form a log. 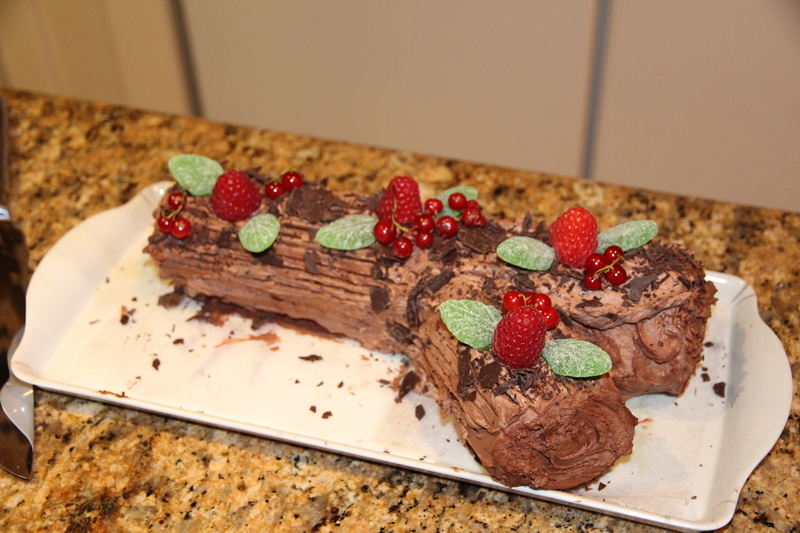 Spread remaining cream over entire log, reserving a small amount for the branch. Cover loosely with foil and refrigerate for at least 6 hours to set. Just before serving, cut cake diagonally about a quarter of the way in and use that piece as a branch off the main log. Patch it up with the remaining cream so it looks attached. Use a fork to make some lines along the branch to look natural and then sprinkle with grated chocolate. Decorate with some raspberries and spearmint leaves and serve. Enjoy! Adapted from Arnott’s ‘Bake and Create’ Recipe booklet.